I have lived a long life, and I have enjoyed many, many desserts. I love to bake, but with the craziness of the holiday season I find I am spending a LARGE amount of time in my kitchen. So while I love to do big holiday treats like sugar cookies, gingerbread cookies, and all of the more involved baking I also love to make sure to add some easier “baked” goods to my list like microwave fudge and these amazing Oreo Truffles. Oreo cookies are delicious. I love to use them for baking. we have made oreo cheesecake and oreo cream pie in our home many times. Oreo truffles however require no baking, and are a fun and popable holiday treat. It does not require any baking, but it does have a couple of simple steps. My kids love to help with this one because it requires bakers chocolate and they love to help dip and roll the truffles in chocolate. They also enjoy putting candy canes in plastic bags and smacking them repeatedly with the mallet in order to add a pepperminty topping as the truffles chocolate hardens. The fun thing about these truffles is you can change the appearance for different holidays, parties, or simply make half a batch look one way and half another way. The possibilities are endless. Top them with crushed candy canes, sprinkles, shaved chocolate, whatever you love. They are incredibly popular too. Very few people can resist an oreo cookie, and this truffle makes an oreo cookie even better. Head on over to Recipes Food Annisa for the full tutorial now. You will love it! This entry was posted in Food & Recipes and tagged Dessert, holiday baking, holiday goodies, holiday treats, no bake cookies, no bake dessert, no bake truffles, oreo truffles, recipes, recipes food annisa, sweet treats, the boys store, treats on December 22, 2018 by Lacy. Let’s have a Monster Bash!! Halloween is for fun, fright, and food! I love getting to bake and create amazing meals, snacks, and treats to spook and delight my family. This year we are planning a Halloween Monster Bash to celebrate Halloween and my youngest’s birthday (his birthday actually falls the week after Halloween but he ADORES Halloween so we celebrate then!) I get the privilege of creating an incredible birthday cake that is Halloween themed. We are planning a Monster Bash so I want to continue with the monster theme and create a monster cake. I scoured Pinterest for incredible ideas and came up with this fun and simple design from The Cake Blog. 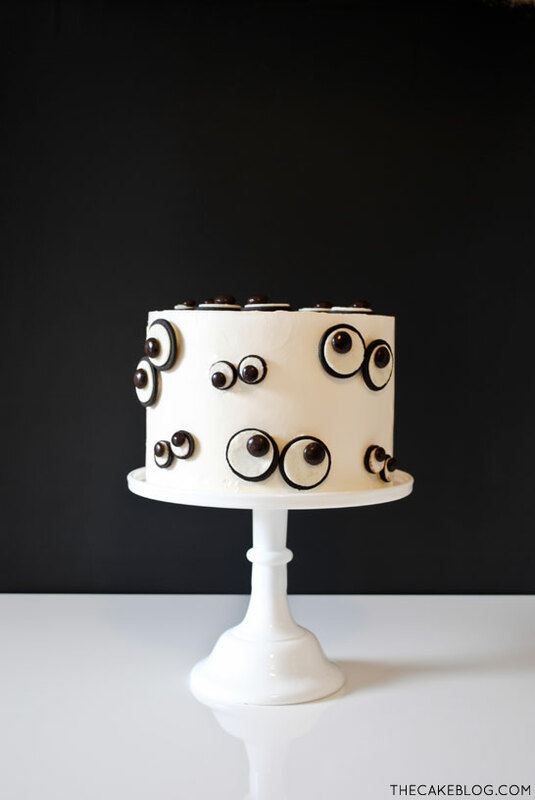 This Monster design features frightening monster eyes on a plain white iced cake. It is so simple, and so perfect I cannot wait to bake it. My son was so excited he wanted me to do a test bake just so he could eat it twice! We didn’t do that, but we did decide that we would put a fun gel in the center of the cake to make it more ghoulish and monster-like. We plan to make white cake with that we have died green, with lemon jelly as the filling. My son thinks it will be perfect for his party. The fun of cakes is how much you can change and still achieve the same aesthetic. While we are changing the inside of the cake to fit our purpose the outer part of the cake will remain the same as The Cake Blog’s original vision. This entry was posted in Food & Recipes and tagged birthday party, cakes, Dessert, food, halloween, halloween cakes, halloween party, Halloween treats, monster bash, monster cake, party cakes, recipes, spooky cake, the boys store, the cake blog, treats on September 22, 2018 by Lacy. Summer has officially started at our house. School is out! As a way to celebrate the last day of school we planned a whole day of fun at school, a field day. Each grade level was in charge of an event. Luckily I was in charge of dessert, because I did not want to be in charge of the water games or the races. Instead I enjoyed a nice cool afternoon in the shade with a very large tub of ice-cream and some really delicious cookie cones. We found this fun recipe on Pinterest, Thank you Ashlee Marie for a fabulous and fairly simple recipe. We followed the recipe and tutorial and made the cones ahead of time to be ready for field day. Since the recipe only makes 8 cones and we had to have one for each kid in the classroom we had to triple the recipe. But the results were fabulous. We made sure we had plenty of ice-cream and we were ready to go. The kids were absolutely obsessed with these cones. They tastes amazing, they held up well, and they were just like eating chocolate chip cookies with our ice-cream — only better! They would make an excellent dessert at a party, summer barbecue, or just for one night after family-dinner. Be sure you check out Ashlee Marie for the full recipe and tutorial — including a video — and be sure to check out her other amazing ideas and recipes! 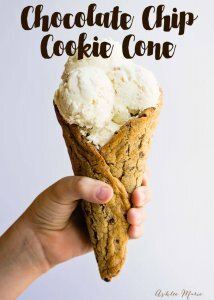 This entry was posted in Food & Recipes and tagged ashlee marie, cookie cones, cookie ice-cream cones, food, ice cream cones, recipes, summer dessert, summer treats, the boys store, treats on May 28, 2018 by Lacy.